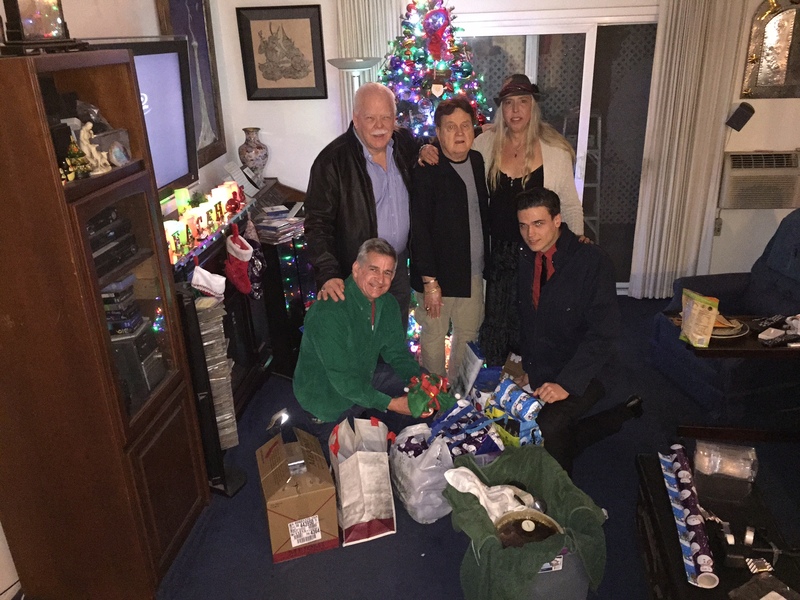 Rick Watts and Lee Walkup had four people join them for Christmas dinner this year at their home in West Hollywood, but the roommates cooked a turkey big enough to feed 20 people. When it came it came time to divide the leftovers, they didn’t send their guests home with doggie bags, nor did they keep any food for themselves. 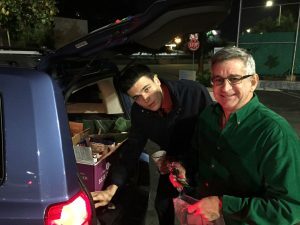 Instead they put the leftovers – turkey, stuffing, mashed potatoes, gravy, green beans, corn, yams and pumpkin pie – into to-go containers and went in search of homeless people to feed. With their SUV loaded with holiday meals, they started their journey. 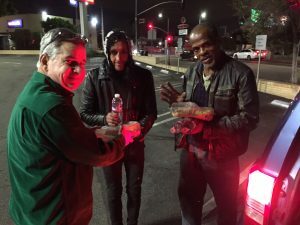 Spotting a few homeless people sleeping on the southeast corner of La Brea Avenue and Sunset Boulevard, Watts approached them, asking “Have you had a meal tonight?” Two had eaten, but one had not, so they gave him a meal, along with plastic utensils, napkins and a bottle of water. The man was grateful and thanked them profusely. Next, they saw a homeless man sleeping at a bus stop along Hollywood Boulevard at La Brea and also gave him a meal. They headed to Hollywood United Methodist Church on Franklin Avenue at Highland Avenue, a spot where they frequently see homeless people sleeping. They’ve become friendly with a woman named Raquel, who’s been sleeping in front of the church for years. But this Christmas night, no homeless people were found there. They hoped Raquel got into a shelter for the night and moved on. Feeding the homeless has been a Christmas tradition for John “Rick” Watts since 1995. That year, four friends stood him up for Christmas dinner, and he didn’t want to throw away the meal he’d prepared. Watts recalled that his stepmother, Barbara, used to always take food to homeless people on Christmas Eve. So he decided to “make lemonade out of lemons” and do the same. He fixed to-go plates and gave them to the homeless people he could find around town. When Watts moved into Lee Walkup’s apartment on Sweetzer Avenue in 2005, he continued the tradition, but didn’t tell his new roommate about it. Walkup thought it odd that Watts was preparing large holidays meals and disappearing with all the leftovers, but they led separate lives, so he didn’t question it for the first year or two. Finally, Watts confessed what he was doing and Walkup wanted to join in. The two eventually began involving their Christmas dinner guests, asking their help prepare the food containers and inviting them to come along to hunt for homeless people to feed. Along Hollywood Boulevard, Watts and Walkup see a homeless person crossing the street. Watts rolls down the car window to ask if he has eaten, but the man does not hear him. When they find a parking spot, Watts approaches several nearby homeless people. Two have eaten for the night, but one has not, so Watts gives him a turkey dinner. Watts is adamant about only giving a Christmas meal to people who have not eaten, which is why he and Walkup go to Hollywood on their quest to find the hungry homeless. 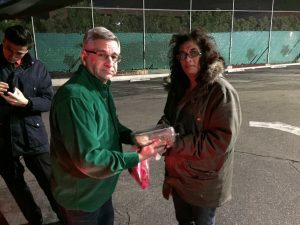 While West Hollywood has its share of homeless people, experience has taught him that WeHo’s homeless tend to have had a holiday meal, thanks to other concerned residents and some of the area restaurants and clubs. For example, the Laugh Factory on Sunset near Crescent Heights hosts a free Christmas meal drawing hundreds each year. With an estimated 46,000 homeless people living in Los Angeles County, Watts and Walkup head further east in search of people who have not eaten. They know of a homeless encampment in Silver Lake on Myra Avenue under the Sunset Boulevard bridge. There they hand out six meals. Most people there want beef stew, which Watts dishes out from a crock pot into plastic cups. Two years ago, Watts started cooking beef stew as well as the turkeys, so they could feed more people. On a cold night, like this Christmas night when the temperatures have dipped into the 40s, many prefer the beef stew since, coming directly from the crock pot, it is hotter. When they don’t see a seventy-something Japanese man who’s been on Myra Avenue the past several times they’ve handed out meals, they ask about him. Nobody there knows where he is. “He seemed pretty sick the last time we were here. I hope he didn’t die,” Walkup said. After handing out meals for 21 years, Watts has gotten insights on how to complete his mission. When he initially approaches homeless people, he does so alone. Too many people approaching them at once can frighten them, so the others working with Watts stay in the car until they know they have some hungry people to feed. Similarly, Watts doesn’t wake up anyone or “knock on” their tent (if they have one). He simply stands on the sidewalk, asking in a calm voice who hasn’t eaten that night, and feeds those who respond. Over the years, Watts found that people would frequently ask if he had spare socks or a blanket, so he started buying those in bulk to hand out with the meal. He and Walkup started wrapping the blankets and socks in Christmas wrapping paper. Now, they have their dinner guests do the wrapping while they have appetizers before the meal. They head to the Home Depot on Sunset Boulevard at the 101 Freeway. Homeless LGBT young people regularly sleep on the sidewalks of the side streets there since Covenant House, which serves homeless youth, is nearby. There they find three people camped out. One of their dinner guests, Anatolii Shtapenko, a Ukrainian tourist from Odessa who they recently befriended, is enthused by this excursion and asks to be the one who approaches the homeless. Two don’t wake up when Shtapenko approaches, but one does. So, he gets a meal, blanket and socks. With a dozen meals still to hand out, they move along. Watts estimates he’s given out about 250 meals to homeless people for Christmas since 1995. He has extended the tradition to Thanksgiving meals as well and estimates he’s fed another 250 meals for Thanksgiving over the years. In Los Feliz, where Hollywood Boulevard intersects with Vermont Avenue and Prospect Avenue, many homeless tents are set up in the traffic island. There they give out eight meals. One of the people they serve is a woman named Susan, who Watts and Walkup have fed several times in the past year. Another man, David, said he moves around regularly, rarely sleeping in the same place two nights in a row. He just happens to be here on Christmas night and is grateful for the meal. Helping the homeless for Christmas is an idea others have adopted as well. On Myra Avenue, a half dozen pairs of new shoes sit on the sidewalk. The people at that homeless encampment report donors left the shoes there earlier that evening, and many of them are already wearing the new shoes. Similarly, at the encampment along Vermont in Los Feliz, homeless people report some people came by earlier offering bags of toiletries. Watts recalls in 2003 while handing out Christmas meals, he found a homeless teenager lying, face down, in the middle of Santa Monica Boulevard near La Brea. Watts pulled him out of the street before he was hit by a car and learned the teen’s parents had kicked him out of the house a few days earlier for being gay. The teenager was so distraught that he laid in the street hoping a car would hit him. The suicidal teen refused the meal Watts offered, but a little later, when a few other homeless people came by, Watts offered to feed them and the distraught teen agreed to eat with them. Years later, one of those other homeless people spotted Watts at the LGBT Center’s Village on McCadden Place and came to thank him. With four meals left, Watts and Walkup and their friends go to Selma Avenue at Schraeder Boulevard, near the Los Angeles LGBT Center, where they find about a dozen people camped out. Some don’t wake up as they ask about whether they have eaten that evening. But the ones who do gladly take the meal and share it with others who are awake and hungry. Watts feels bad that they stumbled upon this large encampment but don’t have enough meals for everyone there. He makes a mental note to come by there earlier the next time. That next time will be in January. Several times during the year, Watts fasts and gives the meal he would have fixed for himself to homeless people. He got the idea of fasting in 2011 after learning that Rev. Jim Wallis, of the progressive Christian organization Sojourners, was fasting in protest of federal government cutbacks to poverty feeding programs. That year, Watts fasted for the three and a half days leading up to Easter. The next year, Watts did a week-long pre-Easter fast and also fasted on his birthday in late January. This year, he also intends to fast on Martin Luther King Day as well. Each meal that he does not eat, he gives to the homeless. When others heard about Watts’ periodic fasting, they liked the idea and wanted to contribute. 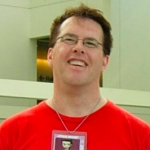 Consequently, Watts created the website Fasting2Feed.org to explain what he is doing and where people can contribute to fight hunger and poverty. Thank you Rick; I know from personal experience that you are always there when people need a hand. Thanks also James Mills who joined us for the evening and helped–and then surprised us with this piece which we did not know he would be doing when he joined us for dinner. Thanks also to Hank for giving voice and publicity to the issues surrounding homelessness: Inly with the help of a free, skilled and dedicated press, can the public better know–and prepare to address this and other problems through the involvement readers, leaders…and common citizens who simply want to help make this a better and more humane world. Happy Holidays of whatever sort you might observe and celebrate. Let us remember that even in our diversity, we are nonetheless of one Creator and therefore brothers and sisters in a larger sense. What a wonderful christmas gift to the people in need, and to yourselves as well. I’m so happy to learn of you doing this. Bravo friends, bravo. Those photographed seemed happy to do so. If it can shed more humanity on the issue, so be it. Thank you Rick and Lee for your generosity and humanity. Right. The homeless are invisible on the streets so why not make them invisible in pictures? No one should ever know the homeless are real people with faces? Rick (and Lee) are always there to help people.. two very selfless good eggs. Although very commendable, I don’t think taking the photos of the homeless was a good idea.